Pop quiz! Which Jameis Winston accusation does the following statement from Florida State University Athletic Director Stan Wilcox refer to? "We have kept both the conference office and the NCAA apprised of our efforts on this matter. The University takes very seriously any and all allegations of potential rules violations and processes them in accordance with ACC and NCAA policies and procedures." Just kidding. This is college football. Of course it's B! Another fun fact. 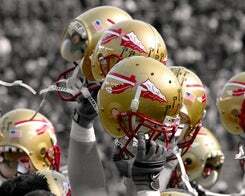 Today, the FSU Seminoles played Notre Dame. Both of those universities had women accuse football players of sexual assault, and both of those universities dragged their feet on the issue. But you know what motivated Notre Dame to hire a private investigator when one of its football players ran into serious relationship problems? A fake girlfriend. Notre Dame: where being an imaginary woman is safer than being a real one.